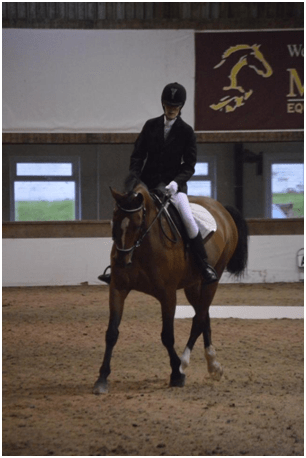 Johanne Picken is passionate about Dressage. So how does someone who has seemingly wrestled with obstacle after obstacle overcome them and keep going? After meeting her on facebook she asked me for Dressage advice and I couldn’t help her! Essentially because her difficulties were outside of my area of expertise, a few communications later I was intrigued by Johanne’s story. In a twist of fate she has actually helped me – I have found myself questioning my resolve and the meaning of the word difficult! We all have issues with our riding that we need to overcome. So what’s stopping you from achieving your dreams? Not enough money for a horse of your own? Major spinal surgery with complications and having to learn to walk again? Clinical depression that keeps you housebound? Blood and/or respiratory disorder requiring constant medication? Loss of your 4 year old horse under tragic circumstances? Body parts that are physically unable to do what your brain asks? Fellow Equestrians’ disapproval of you and your horse? Here’s Johanne’s story. It’s not short. I tried to edit it but it’s all so relevant that I couldn’t take any of it out. …“I fell in love with horses at the tender age of 3, after being sat upon my Aunt’s thoroughbred. After that, all I could think about was horses. My dreams were filled with my own beautiful steeds and for a very long time that was all I had – the wistful dreamings of a little girl. Coming from a single parent family, and being an only child, options for ‘extra-curricular’ activities were limited, but I managed to pester my long suffering mother into submission, and at the age of 7 got my first riding lesson. I was fortunate, my cousins had horses, and I would spend summer holidays on their farm, playing gymkhana games and riding through the fields and round the village. I loved every last second of it. From the age of 17, I had problems with back pain. It became so bad that I had to give up my job. At 26 I underwent major spinal surgery, as the very last disc at the base of my spine had prolapsed, and was pressing on my spinal chord; if I didn’t have this operation, I would lose the use of my legs. Very straightforward – the removal of the disc – fusing of the gap which would be left with orthopaedic cement. After the op, the surgeon explained that things were not so straightforward. When he removed the offending disc, he found that my spine was so unstable he’d had to bolt it onto my pelvis with 4 titanium screws. I was left with a 6 inch scar, a terrible amount of pain, and a lot of rehabilitation ahead of me. Over the next few months I had to learn to walk again. Although my spine was now stabilised, and the offending disc removed, I was left with nerve damage and numbness in my left leg. Something I would just have to learn to live with. I was housebound 90% of the time and due to my immobility I put on a lot of weight. I became depressed. A couple of years later, I contracted pneumonia and pleurisy, and subsequently ended up in hospital. It was during my hospital stay that they discovered that I also had pulmonary embolisms. Further tests revealed that I have a blood disorder – Factor V Lieden Deficiency. This means that my blood clots too quickly, and my immobility and weight had caused clots to build up in my lungs. I was given Warfarin (a blood thinning drug). Despite this I had 2 more episodes of pulmonary embolisms, so I now have quite a high dose to stop it happening again and will have to take it for the rest of my life. I soon realised that, in order to minimise the chance of getting more clots, and to ease some of the pain I still had in my back that I HAD to change my life for the better, starting with some form of exercise. After a lot of soul searching, and long, tearful discussions with my wonderful mum, I needed to come up with something I could do that I enjoyed; something I was good at, that would help turn my life around. That was when horses came thundering back into my life. Horses were my first love, and despite having not been around them for some time, I knew, somehow, that horses were the answer. Unsure as to whether or not I’d be able to ride again, I decided to take up carriage driving. Finally I had a reason to leave the house, something to look forward to, and was enjoying being with horses again. Over the next couple of years, I gradually lost weight, going from a size 18 down to a size 8; I came off the antidepressants and slowly began to feel alive again. I was a bit fitter, not as heavy, now I wanted to try riding again. I first tried riding a friend’s horse, and found, to my immense joy, that I hardly had any pain at all when in the saddle, and my passion for riding was thoroughly rekindled. I was able to move around freely, run, and fly, the horse being my legs and my wings. Something I thought I’d never feel again. This fuelled my passion even further, to the point where eventually, with my doctors blessing and my mum’s help, I got a horse of my own. At 34 years old, my dream of having my very own horse had finally come true! He was a piebald cob, whom I named Jonesy. Sadly our time together was only to last a few months, as he was diagnosed with chronic Uveitis, which causes blindness, shortly after I got him. Despite my vets and my best efforts to curtail the progress of this dreadful disease, I had to make the decision to have him PTS – he was blind and in a lot of pain. He was only 4. I was heartbroken. After the loss of Jonesy, I made a passing comment to a fellow livery at the yard where I had kept him, saying that if she heard of any horses for sale that might suit me, to let me know. Turns out that she was selling her 15 year old bay gelding… That’s when I met Loriot. When I first met Loriot, or Lolz as he’s affectionately known he was fat. Most people didn’t think he’d amount to much. But something inside me told me that, he was something special. Over the next year, with the help of my vet and an excellent equine phyiso, Lolz lost the weight and became fitter and a whole lot happier – just as I had done. He was transformed from a fat wee boggle of a horse, into a shining example of his breed, which I had discovered thanks to the brand on his left thigh, to be Hanoverian. Looking deeper into his past, I found out that he was of impressive pedigree, and after getting in touch with the Hanoverian Verband, and his previous owner via Facebook, I found out that he had been bred in Germany and brought over to the UK for a particular purpose – Dressage! Dressage was something that I had never been particularly interested in, and therefore knew nothing about. Lolz however, knew all about dressage. He’d been very well schooled in the art, and without my even realising, he began to educate me. I soon found myself doing shoulder in, leg yield, and extended trot – which is his forte! And, to my surprise, I really, REALLY enjoyed it. So, I started taking dressage lessons. My instructor, as well as Lolz himself, helped me learn the correct aids to ask for the different movements. With my left leg being quite numb, I find leg aids a bit more difficult, and I have to exaggerate the movement in my weaker left leg in order for Lolz to fully understand what I’m asking of him. In June this year, we started competing in unaffiliated competitions. There are people out there who think I’m completely off my rocker. They wonder why on earth I choose to participate in a sport where I run the risk of being injured, on a horse that is far from easy, especially with my disability and various other health problems. The answer is simple. I do it because I want to. I’m at my happiest when I am in the saddle, and we only get one shot at this thing called life, and I want to live mine to the fullest. Sometimes I can get frustrated with myself, angry at my left leg for not doing as it’s told, angry at fate for giving me degenerative discs in my spine, and I’d be lying if I didn’t sometimes wish that I didn’t have a disability, that I was “normal” like everyone else. All I do to snap myself out of thinking like that is to remind myself of all the Paralympic riders, many of them have greater disabilities than mine, and also, to a lesser extent, I remind myself of the handful of people who said that Loriot and I would never be anywhere near good enough to compete in Dressage. Being a bit of a stubborn mare, I’m determined to prove those people wrong! I’m currently awaiting an appointment to be assessed and graded as a para-rider, after which, I will be affiliating with British Dressage. In the meantime, we continue to compete in unaffiliated competitions, and we’re doing quite well. We’ve recently moved on to prelim level, and I can’t wait to move on up the grades. My personal thanks Johanne for sharing her story with us. The Dressage Tipster has published this information in good faith. Information relating to the “state” of Johanne’s horse in a previously edited version of this post has been removed following a complaint from the horse’s previous owners. Sincere apologies are extended to anyone who may have been offended by the content of this article. What a great story it make me feel so happy for her, and may be a lesson to learn that life is here to enjoy, and what a great way to enjoy it is with your horse.